Even though it’s January and I’m on a salad kick, no way am I going to give up cookies. They are my favourite. And what about some chocolatey cookies that taste amazing? Sign me up! Oh, and they’re healthy too! Morning, noon, or night, you won’t find me hesitating to take a bite. What’s in these cookies that counts as healthy? Almost everything. Starting with superfood sweet potatoes, there’s also mineral-rich buckwheat, and unrefined coconut oil. All natural sweeteners deliver plenty of good flavour to satisfy my sweet tooth without remorse. How big to make the cookies is a matter of preference. The first batch I made were smaller two-bite cookies. The coconut coating makes them crispy in the outside, but they are soft and flavourful inside, with walnuts adding just the right amount of crunch. Before I knew it I had eaten six little cookies. That’s what happens when I bake hungry. So good. Here’s a tray of the smaller cookies before I baked them: The cookies stay about the same size after they are baked, so I’m thinking bigger cookies are more efficient. 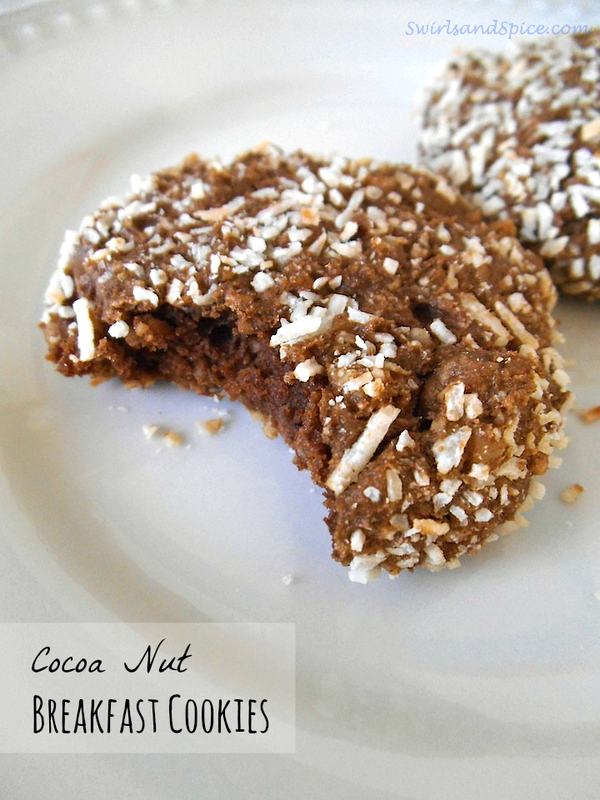 All that cocoa and coconut goodness in an easy to grab format for a great anytime snack or breakfast on the go. Combine sweet potato, coconut oil (or butter), maple syrup, egg, flax, and palm sugar using food processor or electric mixer. Blend until smooth. Sift remaining dry ingredients together, except for nuts. Add dry mixture to wet ingredients and process or mix well together. Fold in walnuts with a sturdy spoon. Cover batter and chill for 15 minutes, until firm but not completely solid. Preheat oven to 325 degrees F (165 C). Form chilled batter into balls with a small scoop or by hand. 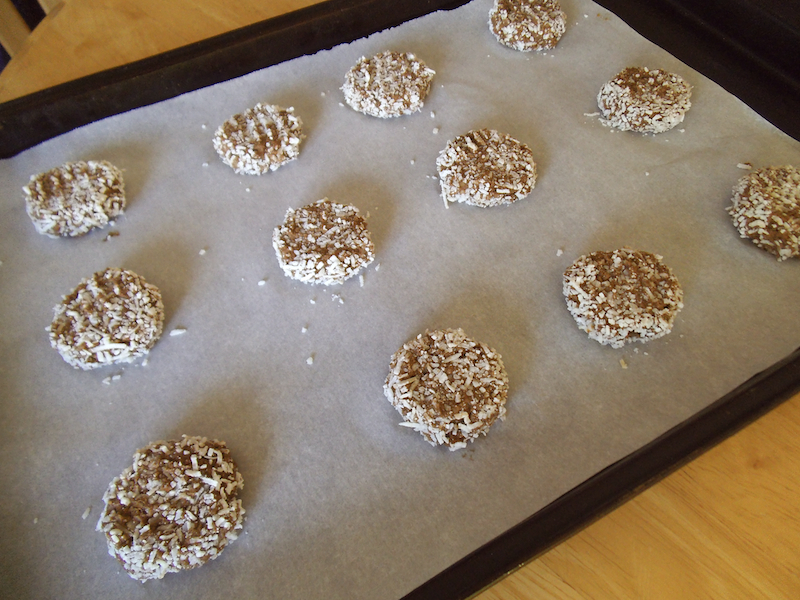 Roll in coconut flakes. Place on parchment lined cookie sheets. Press down with fork to flatten each cookie. Bake for 15 to 18 minutes. Let cookies cool completely on the cookie sheet before storing. I am bringing these cookies to Fiesta Friday this week. I also share recipes at Allergy Free Wednesdays, Savoring Saturdays and here. These are very healthy. Eating a cookie for breakfast just might help me be good all the rest of the day. Love this! I’m so glad you like the recipe! Enjoy! These look tasty and healthy! I am thinking my kids would really enjoy these cookies! Mine did! The cocoa isn’t too strong, but you can add more (or chocolate chips!) if you like them super chocolatey. For me they were just just right amount for the morning. You have made healthy chocolate cookies – incredible!! They look superb and very moreish too. Thanks for bringing these to the party. Happy Fiesta Friday! You are very welcome, Selma. Thank you for hosting! The texture of these looks just perfect! Cookies are my favourite too, January or not 🙂 I’m loving sweet potatoes in baking lately! Thanks, Anna. I love that I can just say yes whenever one of my kids ask for one! 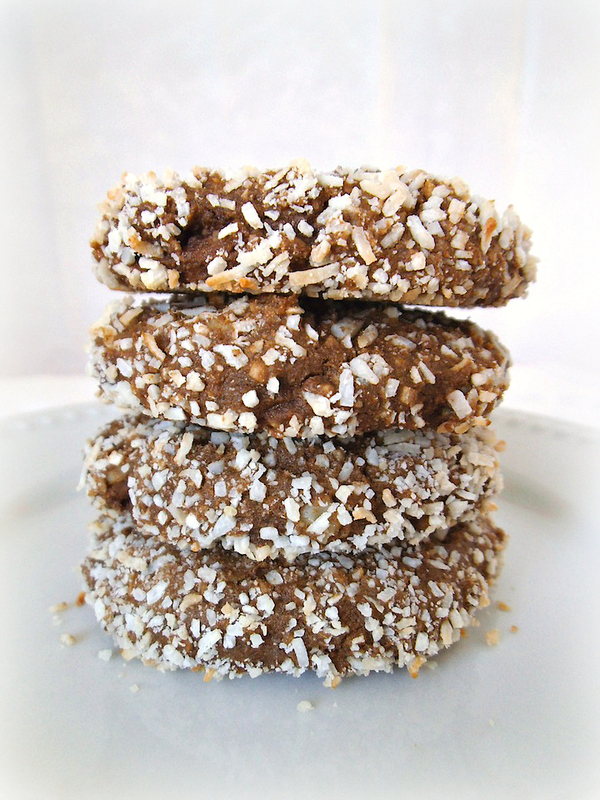 What delicious and healthy cookies, love it and pinned for later! Very delicious cookies you’ve made to share with us this week, thank you!!! They are also very pretty to look at! Thanks! We’ve been enjoying them this weekend for sure! This is a great option for grabbing breakfast on the go! Any recipe with the words cookies and breakfast together is definitely for me! Haha! Thanks for sharing these at Savoring Saturdays! They sound delicious! 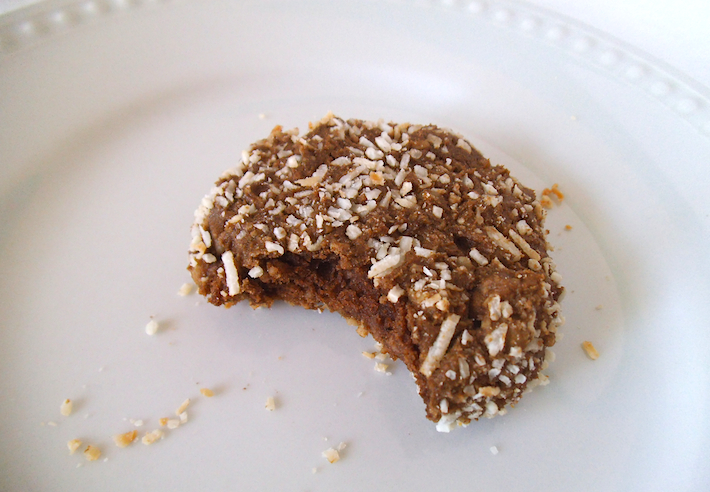 I haven’t made a buckwheat cookie I didn’t like. These look delicious. Thanks! They’re a new quick breakfast favourite! I can never turn down breakfast cookies! Love that you used sweet potatoes in here too! They look delicious! Thanks, Cindy. It’s so nice of you to host and share the recipes far and wide! Thanks, I agree! I prefer the cookies freshly baked or straight out of the freezer. So handy to have around–I need to make another batch soon.